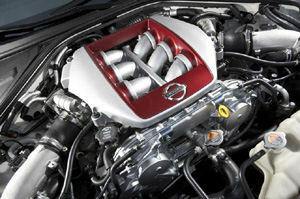 Under the hood, the Nissan GT-R again features the VR38DETT 3.8-liter twin-turbo V6 which is specifically hand-assembled in a clean room environment at the Nissan Yokohama engine plant for the GT-R.
By modifying the boost pressure of the turbocharger, valve timing and air mixture ratio, reducing intake air resistance by enlarging the inlet pipe diameter, and reducing exhaust air resistance through use of an enlarged section of exhaust pipe, this powerplant now produces 530 horsepower at 6,400 rpm and 448 lb-ft (612 Nm) of torque from 3,200 to 6,000 rpm. The engine further features innovative plasma-sprayed bores replacing cast iron liners for reduced friction, lighter weight, enhanced cooling, power output and fuel efficiency; a symmetrical independent intake and exhaust manifold system featuring twin high-performance IHI turbochargers; a secondary air management system for improved cold-start emissions performance; a thermostatically controlled oil-cooling system; an oil scavenger pump to maintain oil flowing to the turbochargers; and a lateral wet and dry sump oiling system. These improvements have also resulted in improved fuel economy estimates 16 city and 23 highway (versus 15/21 in previous years), while allowing the VR38DETT to meet ultra-low emission vehicle (ULEV) standards in the US. The Nissan GT-R features a sophisticated 4-wheel independent suspension system mounted to high-precision six-point front and rear subframes. For the front suspension, the lever ratio of the springs, shock absorbers and stabilizer bar is modified to improve the vertical load response of the tires. Front caster angle is increased from 5°35 to 6°00 to improve tire road holding ability when turning and stability while driving straight. For the rear suspension, toe performance is modified by changing the roll center height to a lower position in order to improve tire grip while making turns and to better communicate driving feel. A special Bilstein DampTronic driver adjustable shock absorber system utilizes multiple vehicle information systems to provide appropriate damping forces and high level of control for a variety of driving situations. The DampTronic system features three driver selectable settings - Normal; Comfort, for maximum suspension compliance; or “R,” for ultimate handling. The same three-stage adjustability is also available for the VDC system and transmission shift operation. Stopping power is again provided by Brembo monoblock six-piston front and four-piston rear calipers with enlarged 15.4-inch front (versus the previous 15.0) and 15.0-inch rear Brembo full-floating cross-drilled two-piece rotors and low-steel high-stiffness brake pads that minimize fade and provide intense stopping performance. The calipers utilize race car-style radial mounting to minimize caliper flex during extreme braking. GT-R-specific lightweight forged 20-inch wheels, with special knurling to assist with securing the tires during hard acceleration or braking, are wrapped with new Dunlop SP Sport Maxx GT 600 DSST CTT ultra high performance run-flat tires filled with nitrogen, sized 255/40ZRF20 front and 285/35ZRF20 rear. Optional Dunlop SP 7010 all-season run-flat tires are offered as part of the Cold Weather Package. 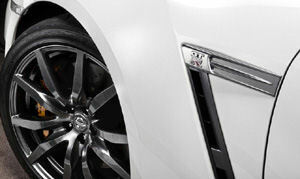 The 2011 Nissan GT-R's newly designed, lighter weight and more rigid forged aluminum 20-inch wheels, manufactured by RAYS, help improve suspension response. Knurling inside the wheels helps keep the tires from slipping around the wheels under heavy acceleration or braking. The wheels feature a premium dark finish, which provides a high quality, high-performance look. The Black Edition comes with special metallic black six-spoke RAYS lightweight wheels in place of the Premium model’s 10-spoke design.